Black male with knobby-end long tail. First sighted on 10 Jan 09. Est 8-10 months. Unsterilised. On the morning of 11 Jan 2009, we went out looking for Brina’s family as usual. We decided to call him Brayden XL Branden. He was a friendly black cat btmao sighted for the first time just a few nights ago. The bigger wonder was that Brina not only tolerated him, but in fact allowed him to share her family’s breakfast, as if he was one of her babies. She even allowed him to eat before her, just like she did with her own babies. We estimated Branden to be about 2 months older than Brina’s brood and were hoping that he would stick around long enough for us to get him sterilised along with Brina and her family. Unfortunately, we have not seen him since. However, this Saturday past, we learnt more about him from A, whom we met on the night of Brina’s trapping. He is, unsurprisingly, another one of Saba‘s housemates, and of course a free-ranging pet cat. He’s not been returning to Saba’s family, and they have actually asked A to help them locate and return him, as they did with Omi. 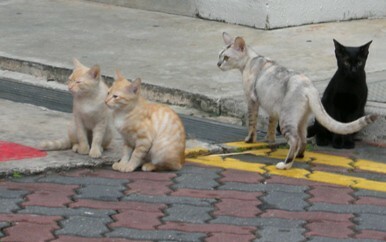 What a responsible and motivated family of cat-lovers, don’t you think?